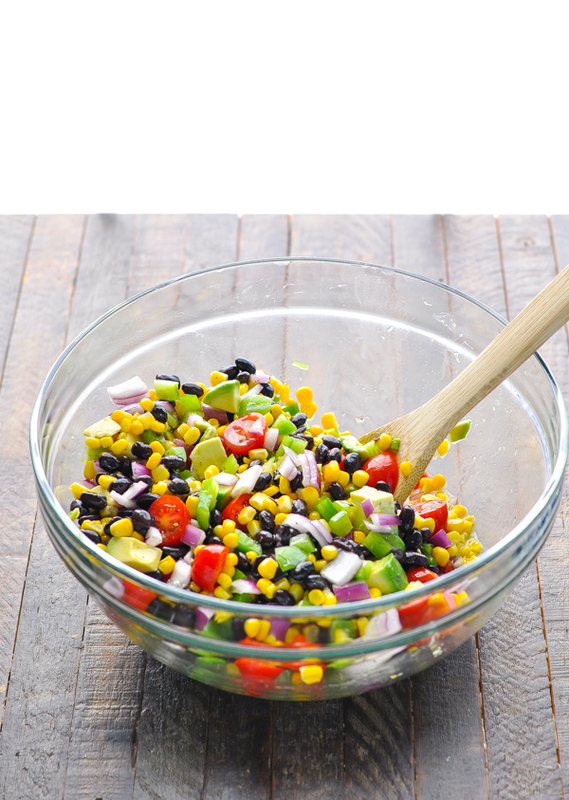 This healthy Black Bean and Corn Salad is the perfect side dish for Mexican night! 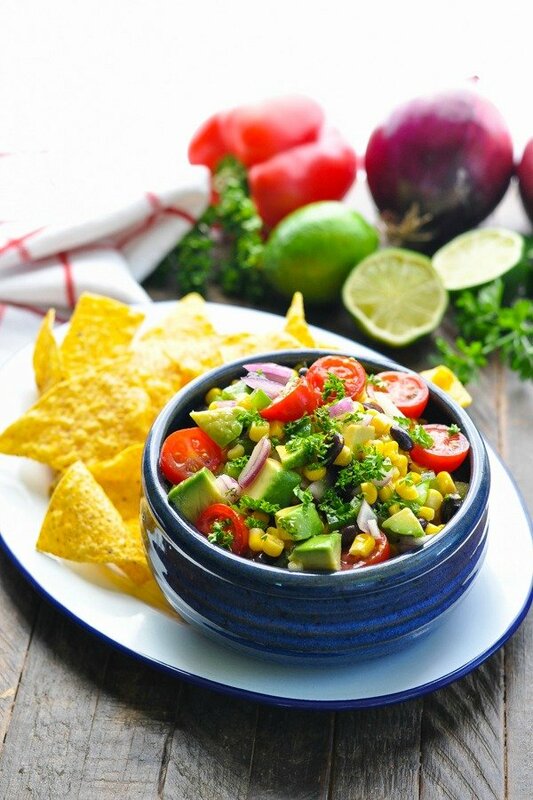 Use it as a fresh salsa and scoop it up with crispy tortilla chips, too! 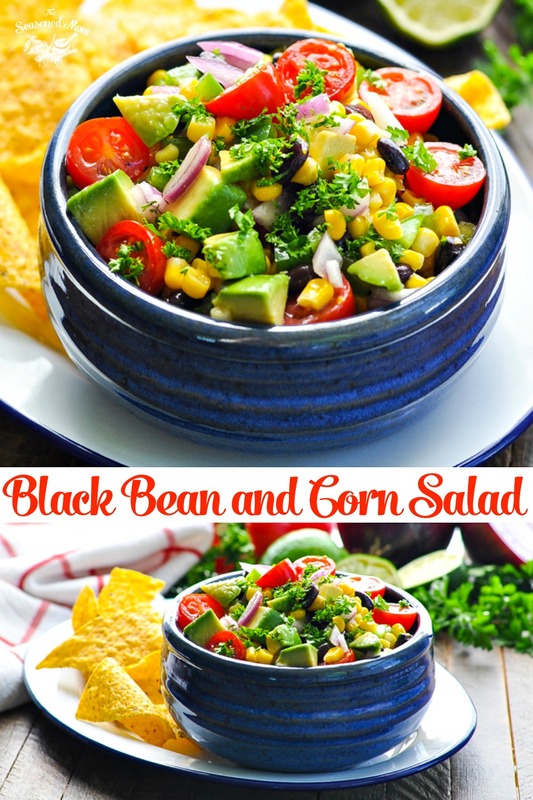 When I was growing up, my mom often served a healthy Black Bean and Corn Salad alongside tacos, quesadillas or grilled chicken. 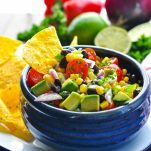 It’s a nice change from a green lettuce salad, and the fresh avocado, tomato and vegetables create a great salsa for dipping, too! 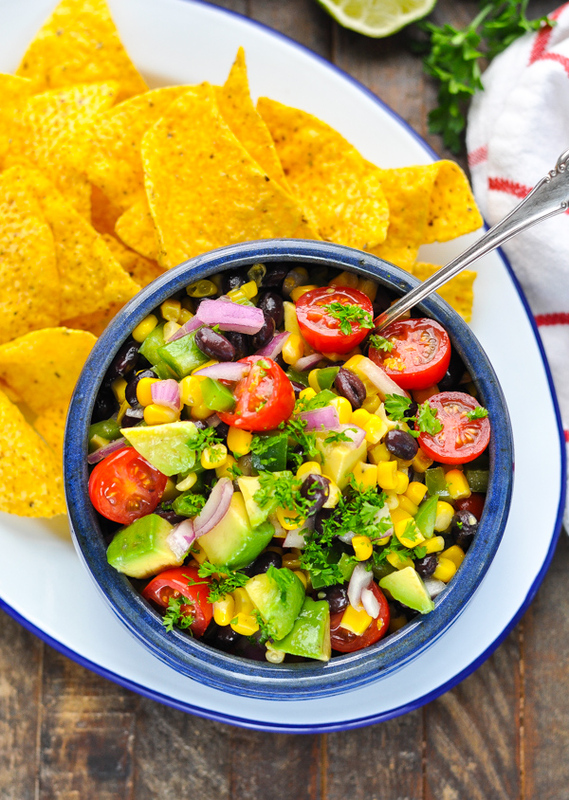 This Mexican avocado salad recipe is my own version of my childhood favorite. I absolutely love it, and I think that it’s equally delicious as both a dip or a salsa with tortilla chips. The perfect easy side dish or party food that can be tossed together in just 10 minutes! Whisk those together or shake them up in a jar until they’re completely combined. Next, in a large bowl, stir together the salad ingredients. Add just enough dressing to the salad to coat all of the ingredients, and then give it another good stir. You can serve the salad immediately, or you can cover the dish and keep it refrigerated until you’re ready to serve. Just before you dig in, be sure to sprinkle the top of your salad with a bunch of fresh parsley or cilantro. It adds such a bright finishing touch! 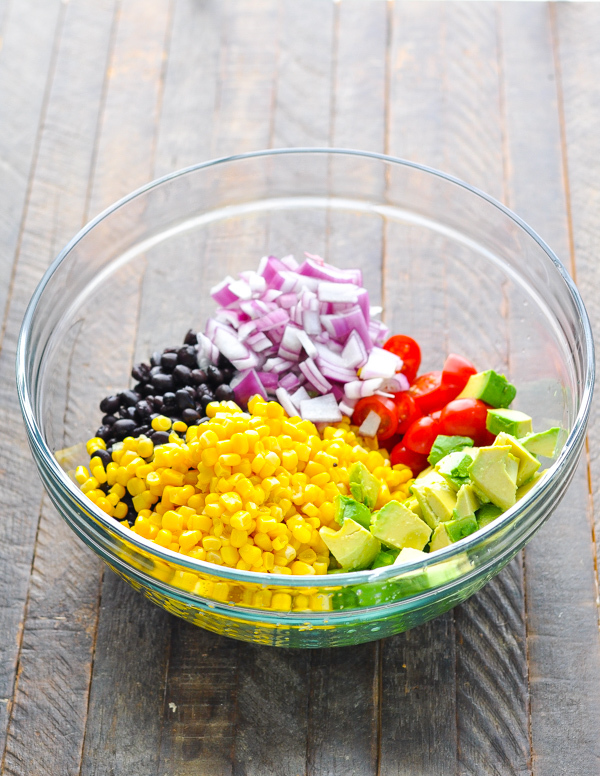 and it would be a delicious component in these Vegetarian Dump-and-Go Burrito Bowls! You probably will not need to use all of the dressing for this salad, so store any extra in your refrigerator. You can use the dressing on other salads, or you can use the extra to re-dress the salad just before serving. You want the ingredients moist and coated, but not soggy. 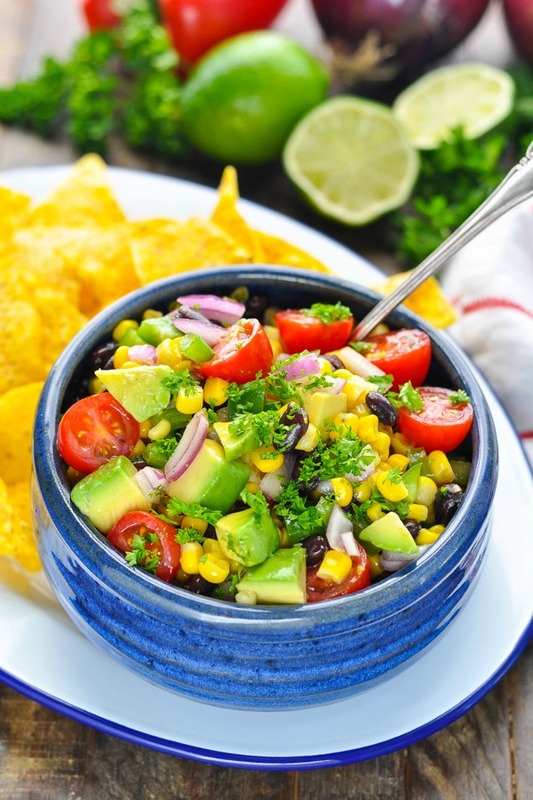 The lime juice in the dressing should prevent the avocado from turning brown. However, when I know that I want the avocado to stay fresh and bright green for at least 24 hours, I toss some additional lime juice with the diced avocado before adding the avocado to the bowl. This salad is best when enjoyed within 24 hours. It will stay fresh in the refrigerator for up to 5 days, but after the second day the vegetables start to get soggy. For a creamy touch, add a handful of crumbled feta cheese or queso fresco to your salad. Instead of the lime juice, you can substitute with an equal amount of balsamic vinegar or red wine vinegar in your dressing. For a shortcut, toss all of the salad ingredients with your favorite store-bought Italian dressing. My mom did this on many occasions, and it’s totally delicious! 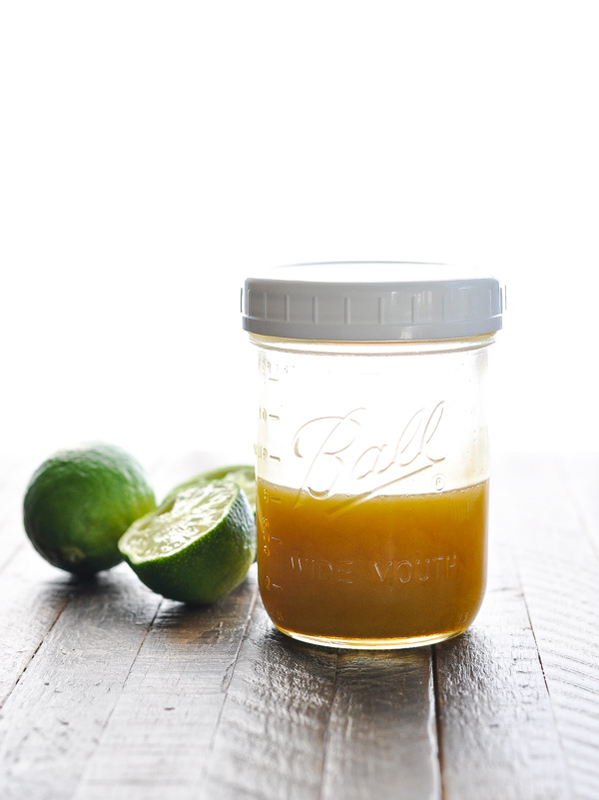 To make the dressing, whisk together honey, lime juice, olive oil and salt (or shake in a jar) until completely combined. In a large bowl, gently stir together all of the salad ingredients. 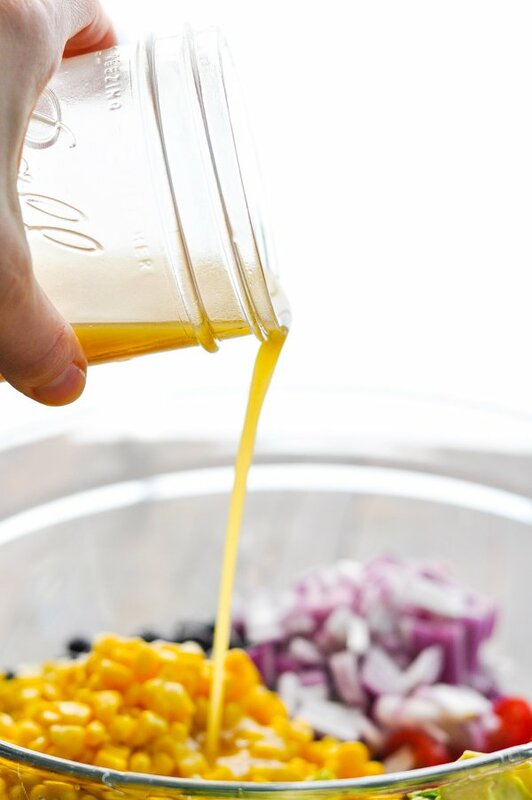 Pour just enough dressing over salad to coat all of the ingredients; cover, and refrigerate until ready to serve. 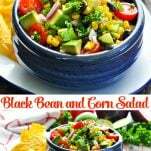 You will probably have extra dressing, which you can refrigerate and use for other salads, or to refresh your Black Bean and Corn Salad just before serving. Garnish with fresh cilantro or fresh parsley, if desired. 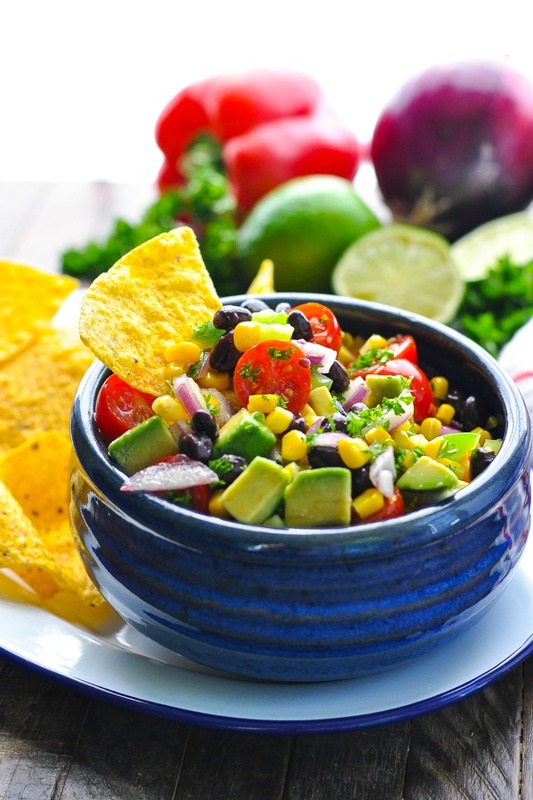 Serve with tortilla chips for scooping! The nutrition information is an estimate, assuming that you use all of the dressing on the salad. If you use less dressing, the nutrition facts will obviously change. For a shortcut, toss all of the salad ingredients with your favorite store-bought Italian dressing. My mom did this on many occasions, and it's totally delicious! It’s my favorite too, Chelsea. I made a batch last week that I worked through each day. I ate it for lunch or dinner constantly (in wraps, on chips, on salad, etc.). So versatile and so delicious!